If you have a computer network that indeed supports your business, Tech Support Dubai enables you to have smooth operations and scalable growth. We access, design, implement processes data fast and efficiently. We understand that how important role a network plays in your work and we make every possible effort to keep your network functioning properly. Our experts are master in network planning and design. What do you want your technology to do for you? Would you like to establish a refresh cycle for your equipment? How does your technology provide you a competitive advantage? Long- and medium-term network design and planning. 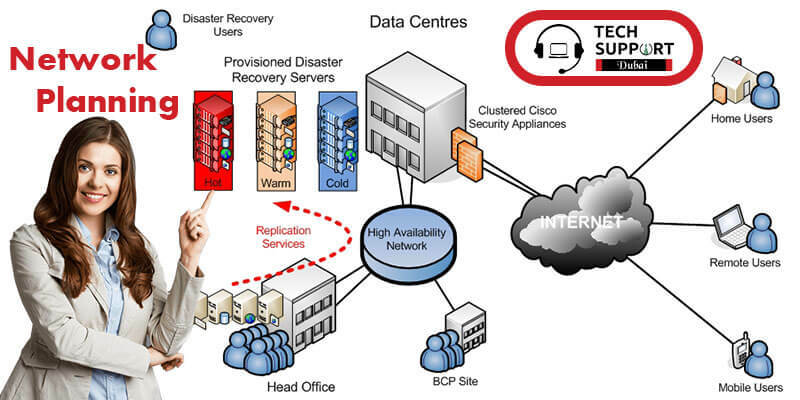 Regular operation and maintenance of a network that processes data fast and efficiently. Will your network be used for data, voice or both? Any budget constraints for the new design? How many users will hold the network? Do you face any issue with the current design? Do you have any business mobility policies such as some remote workers who rely on VPN connectivity? Tech Support Dubai have expertise in network system design and network planning and management. We are one of the leading network design company in the region. Our engineers have highly specialized skills and employ sophisticated methodology and provide clients with the most efficient network architecture and design. We will answer your questions to determine exactly how your requirements and expectations translate to technology. After discussing with you, we establish and implement the plan for upgrades, configuration, technology additions, etc.